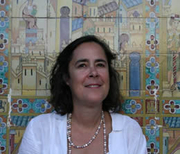 Yale University Director of the Whitney Humanities Center, Maria Rosa Menocal, will give a discussion titled Intimacies and Betrayals: A Glance at the Cultural Entanglements of Medieval Spain on Thursday, May 1, at 6:30 p.m. at the Plaza Branch, 4801 Main St.
Menocal is the author of The Ornament of the World: How Muslims, Jews, and Christians Created A Culture of Tolerance in Medieval Spain. She is a student of comparative medieval lyric and the formation of Castilian culture in the 12th and 13th centuries. Menocal's books will be available courtesy of Rainy Day Books, and the author will sign copies purchased during the event. María Rosa Menocal is currently considered a "single author." If one or more works are by a distinct, homonymous authors, go ahead and split the author. María Rosa Menocal is composed of 8 names. You can examine and separate out names.